Unlike the classic Balenciaga perfumes (Le Dix, Quadrille, etc. 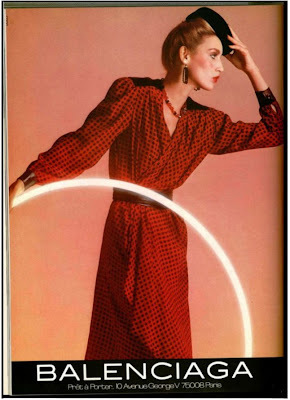 ), Michelle was not a product of the designer's glamorous decades. 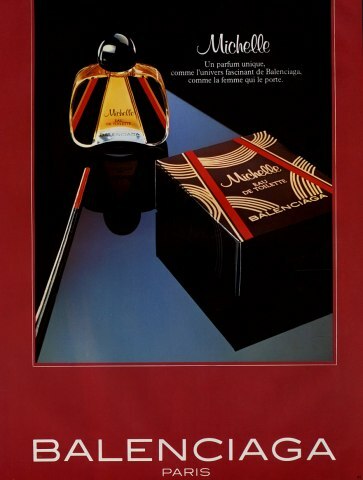 Instead it was launched in 1979, and was, in many ways, a harbinger of the 80s: a loud tuberose perfume with a nice helping of spice and a touch of the tropics. Michelle starts big. It's obviously a white flower fragrance from the first whiff. The EDT (I have a bottle of the extrait de parfum and a mini of the EDT concentration) jumps at you a bit more aggressively, probably because it has more aldehydes (or because my parfum lost most of them over the years), but as other reviewers noted, this is still a Balenciaga perfume, not Giorgio. While I can't really see Dovima and Bettina rocking the gardenia and coconut notes of Michelle while wearing a sculpted Balenciaga coat, it's not vulgar in any way. On the contrary: even the beachy vibe smells luxe, and not necessarily in a Dallas/Dynasty way. The greenery balances it out surprisingly well, and I suspect that some decent raw materials were put into this fragrance. The coconut-gardenia is soon evicted by even creamier notes. Maybe even too creamy: the ylang-ylang is thick and very tactile. It reminds me of hand creams of that era and could have been a bit bothersome if the fragrance was not all about tuberose and carnation by the time I start questioning my choice of Michelle as my scent of the day. The lush transition is even better on hot and humid days when you can fully smell every crevice of the flower. It's as rich and heady as you'd expect, and there are other surprises waiting: Michelle is spicier than Fracas, Chloe (original) and their ilk. The carnation has an almost clove-like facet as it often does, and as Elena from Perfume Shrine has commented, while it's not listed, there is more than a hint of cinnamon. The spice and opulent tuberose lead Michelle into a dry-down that's full on oriental. It's a very satisfying journey of a pretty and wearable perfume that keeps the wearer on her toes (or his. Tuberose can be an equal opportunity stunner). That's the main thing about this vintage (and sadly discontinued) Balenciaga fragrance: it's interesting and adventurous. Notes: aldehydes, gardenia, green notes, coconut, peach, carnation, tuberose, iris, orchid, jasmine, yalng ylang, rose, sandalwood, oakmoss, musk, benzoin, vanilla, vetiver. 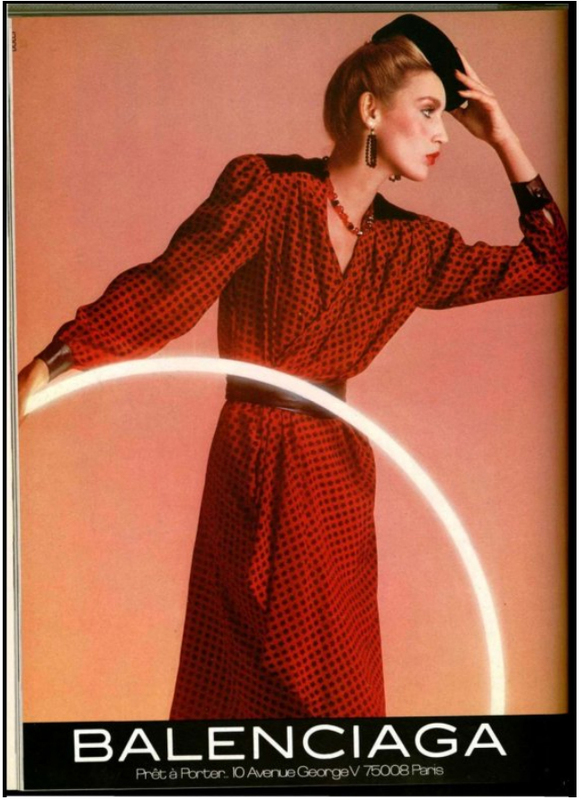 Michelle 1980 ad and a Balenciaga 1979 fashion ad from ana-lee.livejournal.com. Have you tried any product of the line? Michelle is one of the first perfumes I ever purchased for myself as an adult, and it remains an all-time favorite. Such a shame it was discontinued, although there does seem to be an ample supply of intact vintages on eBay, etc. Also, Annick Goutal's lovely Songes is a near scent twin to Michelle, so there is that.